Exclusive GS cut-gears provide incredible cranking power. Precision-machined stainless pinion gear; manganese-bronze main gear; corrosion-resistant construction; high-speed gear ratio with precision casting performance; Penn Versa-Drag; 1-piece open-top construction; lightweight graphite frame and sideplates; 4 aircraft-grade, sealed stainless ball bearings. "When Penn first started making this reel I bought one and started my fishing as a caster, this reel can handle it as so could the first GS series... 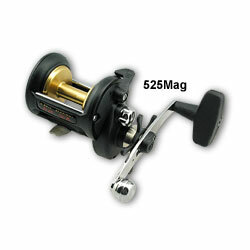 I would recomend this reel as one of Penns best and most sold reels for its durability and lasting power." "Been a long time on spinning reels. This year went conventional and picked up the 525mag on the advice of several people. I was slinging this thing greater distances in the surf right off the beat."